World Today News: Withdrawal at source: "Public finances hello! " Withdrawal at source: "Public finances hello! " 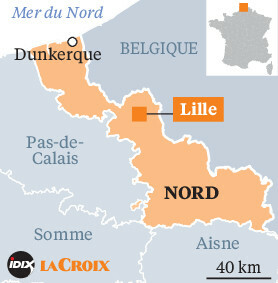 At the center of the public finances of Lille, 40 agents answer the questions of the taxpayers on the tax at the source.
" Public finance hello! How can I help you ? "Nicolas de Saint Jan, general controller in the call center dedicated to levy at the source of Lille, can now respond to about forty calls each day.
" Before the introduction of the toll-free number, on January 2, we managed to process 80 on averagehe explains. User requests were general, simpler to process. Today, they are asking us to act on their rate. As we discover the software, it takes time. " " The majority of calls come from a change of situation: marriage, birth of a child, retirement, resumption of employment in 2018. This causes a modulation of the tax rate "Says Clothilde Desbuisson-Smagghe, director of the Lille Tax Center. On the afternoon of the first day of the reform, an extraordinary influx of people led to a temporary congestion of telephone service at the national level.
" Despite an important communication campaign, it's as if taxpayers were discovering tax at source, adds Denis Putkownik, inspector. Until now, it was still abstract. " In Lille, around 40 public finance officers, including thirty general controllers and ten inspectors - asked for technical questions - participate from Monday to Friday, from 8.30 am to 7 pm, on this telephone platform, including the toll-free number. No surcharges are 0809 401 401. And calls come from all over France, as in the other thirteen dedicated centers throughout the country. According to Bercy, some 90,000 calls were received on January 3 in the early afternoon. Less than the day before, the first day of reform, at the same time (130,000). Since then, Gerald Darmanin, Minister of Action and Public Accounts, reports a " progressive decrease Hoping for a return to normal within a fortnight. This January 4th, it is impossible to note a downward trend in the Lille offices. " The calls are continuous Says Clothilde Desbuisson-Smagghe. According to the unions, a new peak of activity will take place from 25 January, when the first salaries will be paid. Withdrawal at source, "how will a young employee be taken from his parents' home? " " Taxpayers often have the answer to the question they ask us "
The controllers were trained in 2017 and again in 2018. Nicolas de Saint Jan - like all 40,000 agents mobilized in France - attended a total of one week of intensive training to answer taxpayer questions. For the moment, the controller has not encountered any particular problem. " I'm waiting for the trap question. But as I repeat to users: "I do not know everything, but we can find a solution together "He relativizes. " Moreover, taxpayers often have the answer to the question they ask us. Then, they start to doubt and call us to reassure themselves Denis Putkownik remarks.
" Tell me everything ! " Marie (1) divorced and retired seeks the help of a controller by calling the telephone platform. " I had a child that I raised alone, I wanted to check that with the tax at the source I always had a share and a half? Tell me everything ! By consulting the site impots.gouv.fr, Nicolas de Saint Jan confirms the rate and the situation of Marie. " I called to be reassured, know where I was and understand how the device worked She says. Barely time to hang up, the controller opened the file of Murielle (1) who wants to individualize its tax rate.
" Tax has important consequences in people's lives, notes the Comptroller General. I always take the time to check everything. Apart from what is pure taxation, our job is ultimately very human. " Withholding tax from the income tax will automatically distribute the tax payment to each spouse. It will shake delicate balances, which do not necessarily obey the strict financial rationality.